Reface old appliances. Dated appliances are a drag, but if they still work well, don't stress about replacing them. Instead, use appliance paint or adhesives for an instant update. Opt for unique, inexpensive art. Shop thrift stores and flea markets for affordable, one-of-a-kind finds. Etsy, college art shows and craft fairs can be great places to find unique pieces. Repurpose and reuse. Have vinyl records you don't listen to anymore or extra fabric left over from a craft project? Turn these items into wall art. See if there's a way to reimagine old items around your home that can be given new life. Add some greenery. Plants add color and dimension to any room. 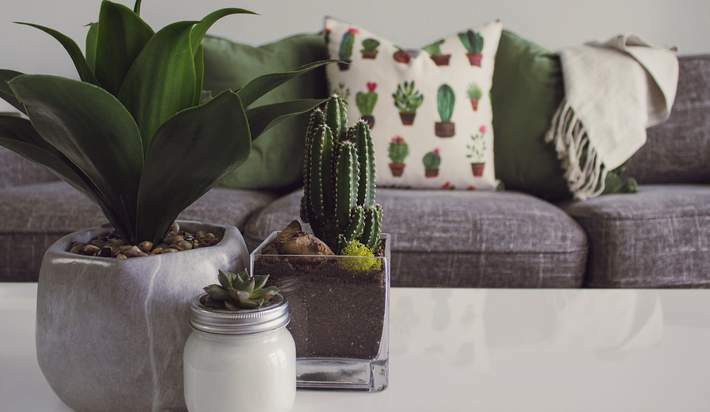 If you're short on space, opt for small succulents or bonsai trees. For more open areas, consider a large snake plant or fern. Swap rooms. Sometimes, swapping furniture and decor between rooms can be enough change to keep things interesting. Switch out bed frames, tables, chairs and linens, and see what new arrangements you can create with what you already have. A beautiful, welcoming home doesn't have to cost a lot of money. If you're ready to start decorating a new home or considering a refinance to fund a bigger project, don't hesitate to get in touch.